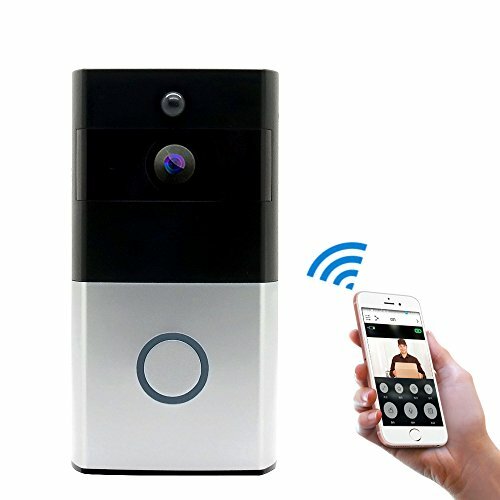 - This Wireless Doorbell only support 2.4G Wi-Fi,(5G Currently Not Supported). - Latest technology 2-way talk with noise cancellation. - Mobile phone remote fast wake up device within 1 second. MIGOOZI Smart Wi-Fi Video Doorbell: With a motion-activated camera, two-way audio and IR Night Vision Technology, you'll never miss a visitor again. See, hear and speak to anyone at your door in real time from your smartphone. IR Night Vision - Day or night, rain or shine, it allows you to take photography and record videos at any time. Answer the Door Whereever you: With the motion detection elert and real time two-way audio technology, you can speak to visitor directly via the "ToSee" app no matter where you are, so you will never miss a visitor,please make sure the Wi-Fi condition is good enought at the door so that the doorbell could work better of you. Motion Dtection & IR (Infraiod) Night Vision: When motion is detected, the app will send you an alert, you are always on the top field. Equipped with infrared lights and PIR Sensor, the camera will automatically switch to black&white night vision view when in the dark to ensure you a crystal view. Battery Powered with Indoor Chime: The doorbell can be powered by 2x18650 battery or USB or AC (8~24v), each way will be OK. (2x18650 Not Included),If our products fail to meet your expection, please feel free to contact us. If you have any questions about this product by MIGOOZI, contact us by completing and submitting the form below. If you are looking for a specif part number, please include it with your message.